A must see during a vacation in Spain is the La Ciutat de les Arts i les Ciencies Complex in Valencia. Every evening in Valencia, Spain, the spectacular buildings of the L'Hemisferic and the Palau de les Arts Reina Sofia illuminate the pools surrounding the City of Arts and Science. These two tourist attractions cater to people of all ages and are fascinating places to visit while on vacation in the city of Valencia, Spain. The architecture of both places is very modern and it gives you the impression of belonging in a futuristic world that was brought to Valencia, Spain from some unknown planet. 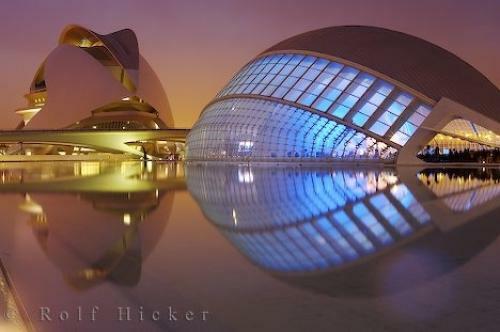 Photo of L'Hemisferic and Palau de les Arts Reina Sofia a must see during a vacation in Valencia, Spain. ... cinema and planetarium that leads you into another galaxy where you can watch a magnificent show of stars, planets and lights in a stunning atmosphere. The Palau de les Arts Reina Sofia was the last of the buildings to be completed at the City of Arts and Science in Valencia, Spain with the official opening in October, 2005 by Queen Sofia. This golden glowing creation is an 1,800 opera house aimed at promoting dance, theatre and classical music amongst the young and old. There are two other halls in the Palau de les Arts Reina Sofia where events can simultaneously take place. One is the "Aula Magistral" with a 400 seating capacity and the other is the amphitheatre where you can seat 1,700 people for special musical events. This will be the symbol of Valencia in the music world just as the Sydney opera house is to Australia.The City of Arts and Science in Valencia has become one of the top tourist attractions for people to see while on vacation in Spain and is definitely worth a day or two of your holiday. L'Hemisferic, and Palau de les Arts Reina Sofia at La Ciutat de les Arts i les Ciencies Complex, Ciudad de las Artes y las Ciencias, The City of the Arts and Science, in the City of Valencia, Valencia, Spain, Europe. I photographed this photo with the digital SLR camera model Canon EOS-1Ds Mark II, aperture of f/13.0, exposure time of 13/1 sec. on ISO 50, as always I used a original Canon Lens, the focus lenght for this picture was 45mm.